California's deep ocean has become the testing ground for robotic missions with far-reaching goals, not only to expand our understanding of Earth's largely unexplored sea floor, but ultimately to probe the mysterious depths of the ice-shrouded ocean of Jupiter's moon Europa. 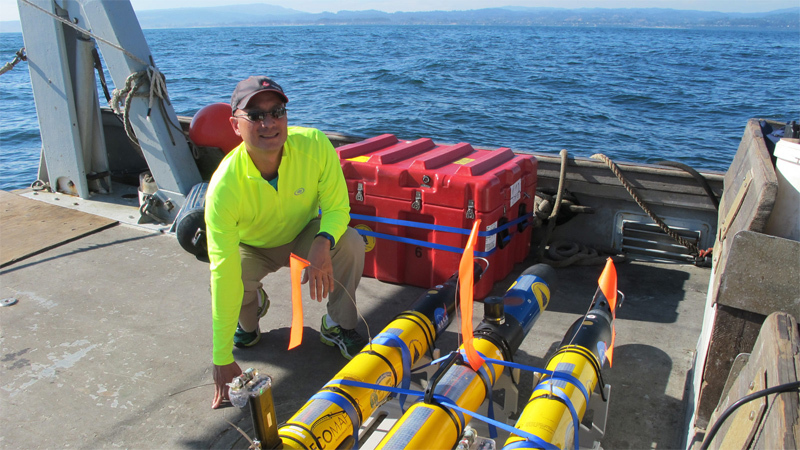 A small fleet of robotic drones are being tested in the waters of Monterey Bay, focusing on changes in water temperature and salinity. The goal of the research is to develop a drone capable of making decisions on its own based on the conditions that it finds, rather than simply responding to instructions supplied by human handlers. The team conducting the tests includes members from NASA's Jet Propulsion Laboratory, the Monterey Bay Aquarium Research Institute, Caltech, Woods Hole Oceanographic Institute, and Remote Sensing Solutions. While the immediate research goal is to expand our ability to explore Earth's oceans using self-directed robots, NASA scientists are casting an eye farther out in space toward Europa. Jupiter's moon possesses an ocean that's hidden beneath an icy crust and contains more water than all of Earth's oceans. In some ways it's easier to explore the surface of Mars than our ocean. Aerial and satellite measurements mostly reveal conditions at the sea's surface, and cannot penetrate the water to any great depth. Sonar can reveal the overall geography of the ocean floor, but does not show us fine details of geological composition and biological activity. Variations in water temperature and salinity, water currents and the physical geography of the Monterey Canyon — not to mention entangled kelp forests and other ocean life — are factors an ocean-exploring robot must be prepared to deal with and then make navigational and scientific decisions upon. By comparison, robotic rovers on Mars only have to negotiate obstacles like boulders, cliffs, and sand and endure the occasional dust storm. The challenge of exploring Europa's ocean is far greater than exploring our own. First, the Jupiter system is half a billion miles away. That's a distance which takes radio signals at least half an hour to traverse — one way. Second, Europa's ocean is topped by a crust of ice that's probably at least a few miles thick. Third, scientists believe Europa's ocean is much deeper than Earth's — possibly 30 miles deep. The deepest part of the Earth's ocean, in the Mariana Trench near Guam, is 6.8 miles deep. 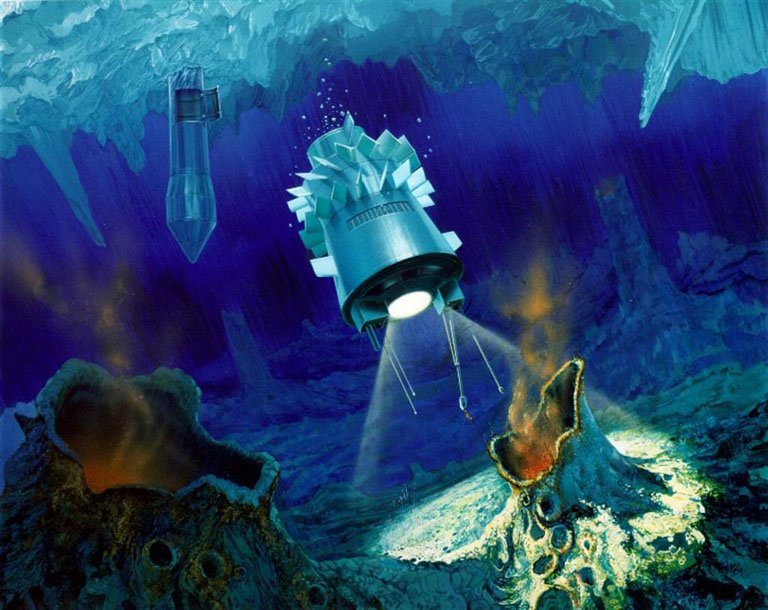 And of course if scientists design and build a robotic submarine to travel to Europa, bore through miles of ice, and enter the watery realm beneath, they might naturally prefer it reach the bottom of that ocean, and see what's on Europa's ocean floor. It's there we might hope to find the thing that's piqued our curiosity: the possibility of extraterrestrial life. 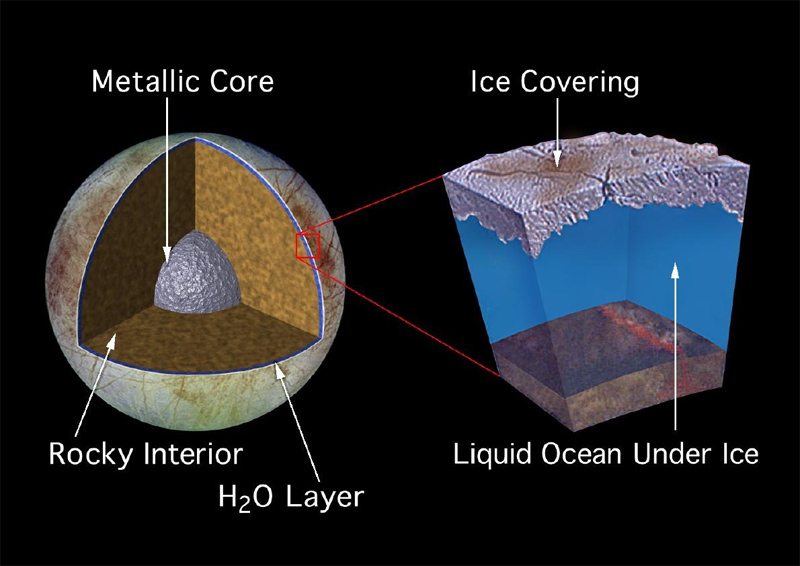 Europa's ocean is thawed by heat energy generated by tidal interactions with Jupiter's gravity, which emerges from the suspected rocky mantle below. Whereas on Earth, volcanic vents on the ocean floor spew superheated, chemical-laden water. And, we have found communities of living organisms thriving around these hydrothermal vents. Complete ecosystems are fueled entirely by the heat and chemicals emerging from Earth's interior — no sunlight required! Could similar conditions exist on Europa's ocean floor, supplying the heat and chemistry to support life in the otherwise dark, sunless world? An answer to this question is the prize we may win with robotic drones that are sophisticated enough to overcome the daunting obstacles ahead. What Might Be Down There? Artist illustrations of the floor of Europa's ocean have depicted scenes thriving with lifeforms resembling corals, anemones, jellyfish and such — creatures that we are familiar with on Earth. If there is life to be found on Europa, odds are that it would consist of single-celled creatures. For most of the multi-billion-year history of life on Earth, single-celled plants and animals were the only life-form. Only relatively recently have multicellular organisms appeared on Earth. 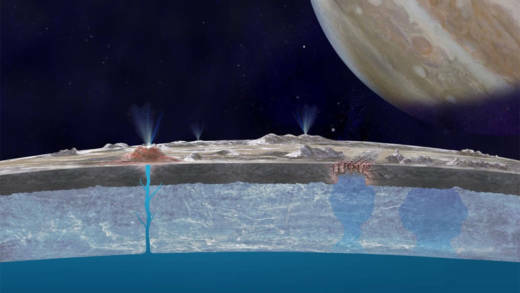 In the near future — sometime in the early 2030s — a couple of missions, one by NASA and another by the European Space Agency, will attempt to analyze water vapor spewing into space from Europa's ice crust, purportedly emanating from the ocean below. These missions could give us a whiff of the chemistry of the ocean, and possibly even signs of life. A drone mission into Europa's ocean is probably a bit further into the future, but the work being done with artificially intelligent drones in Earth's Monterey Bay are concrete baby-steps toward that goal.